The high energy live performances of Mighty Joshua invite listeners of all ages to experience the uplifting spirit of reggae. Original conscious lyrics flow freely as distinctive refrains pulse against rhythms rooted in African percussion. From mountain top festivals to intimate club gigs Mighty Joshua backed by his crew Zion#5, empowers and entertains listeners by opening minds and activating bodies. Encouraging positive change in the community and beyond he has created a forceful and unique expression of reggae for the modern day. As Virginia Reggae Ambassador (2015 & 2016) and Artist of the Year (2014, 2015 & 2016) Richmond based Mighty Joshua has advocated for reggae music by sharing his love of the genre and culture through meaningful performances for the masses. His musical roots in African percussion led to experimentation with sound and rhythm; after exposure to Djembe and Djun Djun drums they became a part of his playing repertoire. He cites as major influences Babatunde Olatunji, Fela Anikulapo Kuti, Garnet Silk, Mutabaruka, Haile I Selassie and Awareness Art Ensemble. 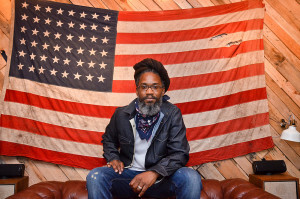 Mighty Joshua became acquainted with internationally recognized reggae artists through Chris Peanut Whitley of Stable Roots Productions who has received many accolades for his role as Music Director/Producer for Corey Harris and touring keyboardist for Corey Harris, Culture, and Eek-A-Mouse. As a result Mighty Joshua provided percussion and backing vocals for Corey Harris albums Father Sun, Mother Earth and Fulton Hill Blues and has opened for internationally acclaimed reggae acts Steel Pulse, Culture featuring Kenyatta Hill, Midnite, The Meditations, The Itals and Ziggy Marley. His own self-titled debut solo album (2013, produced by Stable Roots) is a life inspired compilation that encourages reflection and empowerment for oneself as well as community. He is dedicated to making a difference by working closely with several non-profit organizations both locally and globally, including the Makindu Children's Program in Kenya.